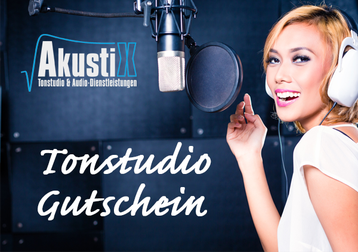 Schenken Sie doch mal etwas ganz Besonderes – einen Gutschein für das Akustix-Tonstudio. Wir bieten passende Gutschein Komplettpakete ab 100,- Euro. Der Gutschein-Empfänger hat die Möglichkeit, seinen eigenen Song im Studio aufnehmen zu lassen, beim Mischen und Mastern live dabei zu sein, und im Anschluss seine eigene CD mitzunehmen! Hi there to every body, it's my first visit of this web site; this website includes amazing and in fact excellent stuff designed for readers. Wonderful goods from you, man. I have understand your stuff previous to and you're just too wonderful. I actually like what you've acquired here, really like what you are stating and the way in which you say it. You make it entertaining and you still care for to keep it wise. I can't wait to read far more from you. This is actually a terrific site. Thanks on your marvelous posting! I actually enjoyed reading it, you happen to be a great author. I will always bookmark your blog and will eventually come back in the foreseeable future. I want to encourage yourself to continue your great posts, have a nice afternoon!